Mon, Aug 6, 2018, 08:57 pm SL Time, ColomboPage News Desk, Sri Lanka. Aug 06, Colombo: Switzerland and Sri Lanka today reaffirming their intention to continue to facilitate and expand cooperation between the two countries signed a Memorandum of Understanding (MoU) to establish a migration partnership. Head of the Swiss Federal Department of Justice and Police, Federal Councilor Simonetta Sommaruga signed the MoU with Sri Lankan Interior Minister S.B. Nawinne in Colombo. The signing of the MOU was preceded by bilateral discussions between the Swiss delegation led by Federal Councilor Simonetta Sommaruga and Acting Foreign Minister Vasantha Senanayake at the Ministry of Foreign Affairs in Colombo this morning. Switzerland has already established migration partnerships with five other countries. The agreement with Sri Lanka is the first concluded with an Asian country, the Swiss Federal Council said in a statement. After signing the MoU, Federal Councilor Simonetta Sommaruga has stated that Switzerland intended to increase the support it gives to Sri Lanka in its efforts to achieve democratic reform, as Sri Lanka still had some way to go. She added that the migration partnership provided a framework for increased involvement with the aim of advancing the reconciliation process, strengthening human rights, creating better prospects for young people in Sri Lanka through vocational training, and promoting safe labor migration in the region. With regard to the return of Sri Lankan nationals, Switzerland will continue to pursue its existing close cooperation with Sri Lanka based on the migration agreement of 2016, which has proven successful. Return issues are therefore not a key consideration in the new migration partnership, the Council said. Federal Councilor Simonetta Sommaruga is being accompanied on her working visit to Sri Lanka, which will last until Wednesday, by a mixed delegation of representatives from the FDJP and the Federal Department of Foreign Affairs (FDFA). 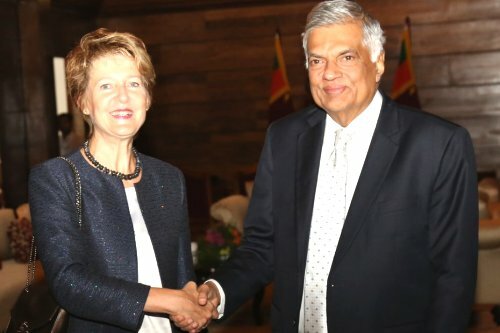 On Monday she held talks with Sri Lankan President Maithripala Sirisena, Prime Minister Ranil Wickremesinghe and Justice Minister Thalatha Atukorala on bilateral relations, the reconciliation process following almost 30 years of civil war, and constitutional reform. The Premier said he had a good meeting with the Swiss Federal Councilor. "We are using our international relationships to take Sri Lanka forward," he added. Ms Sommaruga also met with the chair of the National Human Rights Commission and chair of the Office for Missing Persons. The Office for Missing Persons plays a key role in coming to terms with the past and fosters close contacts with Switzerland. Federal Councilor Sommaruga also met with representatives from various civil society organizations that deal with the migration situation in Sri Lanka and had an opportunity to speak with staff from Helvetas, the United Nations High Commission for Refugees (UNHCR) and the International Organization for Migration (IOM), which run Swiss-funded projects and programs on the ground. On Tuesday Ms Sommaruga is scheduled to meet the Leader of Opposition and the Tamil National Alliance (TNA), R. Sampanthan, during which the two are expected to discuss the needs of the Tamil population. Ms Sommaruga will visit the East to take a look at the projects and programs that Switzerland has been supporting for a number of years. These include the vocational training project in Kinniya involving needs-based education and training in fields such as construction, mechanics, electrical installation and tailoring/dressmaking, with a view to improving employment opportunities and prospects for young people. In Batticaloa Ms Sommaruga will visit an information center for Sri Lankan migrant workers and talk to them about their experiences.